This is a common occurrence from April through October. In spring, males are actively looking for females and territory. Females are looking for good nesting places. In late summer and fall, hatchlings are looking for water. Later still, all turtles are looking for places to hibernate. Sometimes, they’re just moving to a new area. 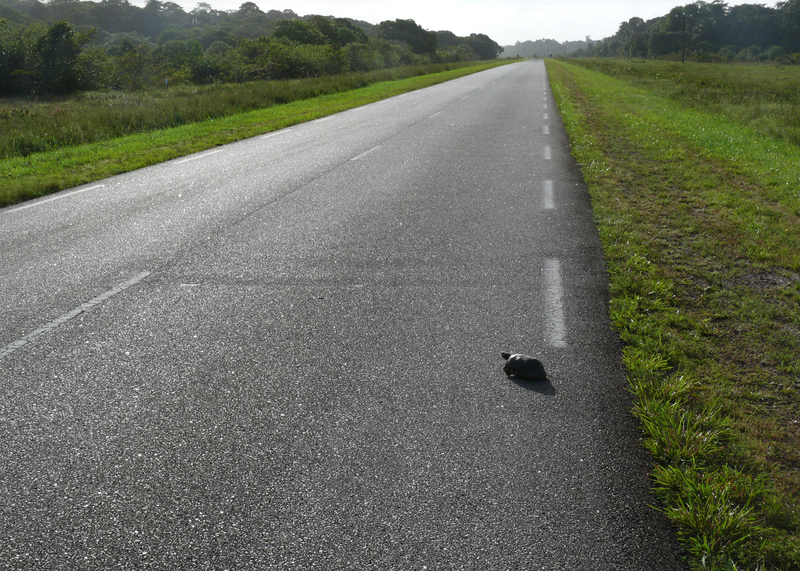 First of all, don’t try to help a turtle if you can’t safely park off the road and keep yourself out of harm’s way. Be sure to turn on your hazard lights. You should never pick up a turtle by the tail — it can hurt it. So, pick it up by grabbing on each side of its shell behind the front legs. It might tuck itself into its shell and or it might kick at you. You can’t be sure, so hold it tight and carry it close to the ground to prevent injury in case it falls loose. Carry it to the far side of the road in the direction it was traveling — it was headed that way for a reason. Turtles should never be turned around. If you do, they’ll just eventually turn back around and try to cross the road again. When trying to help large snapping turtles, don’t try to pick them up. Unless you’re an expert, you’re putting yourself at risk of possible serious injury. Their jaws are powerful enough to deliver a serious bite or even snap off a finger. To move them, use a long blunt object (nothing that will stab them), and gently nudge them across the road. Stay back, don’t use your foot, they can swing around at you surprisingly fast. It’s tempting to take a turtle home as a pet, but that’s never the best thing for them. Turtles require expert care. They shouldn’t be relocated, either. It moves them out of their territory, forcing them to try to find a new one. Some will try to find their way “home” and end up in even more danger. Some stop eating or wander helplessly. There’s nothing you need to do for it. It might live in your yard, or maybe it’s just passing through. Either way, just leave it alone to carry on with its daily activities. Don’t try to keep it as a pet — it’s a wild animal and entitled to be free, unless it’s injured. If injured, contact an expert for advice.